Like state governments across the country facing budget shortfalls, Oregon is looking to cut back. 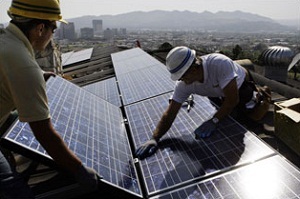 One step it will take soon aims to cut back on solar industry benefits. Business Energy Tax Credit (BETC, pronounced "Betsy") and its residential-variety cousin will be radically changed if the bill becomes law, said John Audley, deputy director of Renewable Northwest Project, a nonprofit that promotes renewable energy including solar in the region. Both houses of the state legislature passed the measure by wide margins, and Audley said he expects the governor to sign the bill, House Bill 3672. "They had to reign in the cost to the state of the tax incentive programs," Audley said of legislators' motivations. "Some elected officials felt that the renewable energy incentives took priority over state policies like public education." The result of the bill is that homeowners and commercial developers won't receive as many tax incentives to install solar panels. The incentives had helped Oregon become a leader in solar energy, Audley said. "The combination of the feed-in tariff and the BETC and RETC made Oregon a very attractive place for solar installations, especially when it came to rooftops and commercial buildings," he said. Feed-in tariffs adjust prices of different types of energy based on the cost of generating that energy. "I think all forms of renewable will be hurt by Oregon's new policies," Audley added. Renewable Northwest supported the change, "given the economic circumstances facing the state," Audley said in an interview. But he emphasized that the measure should be reconsidered as the economy improves. "As the Oregon economy rebounds, we will urge legislators to revisit the amount set aside to promote renewable energy development," he said in a press release. Lawmakers argued that the new bill curbs spending while still encouraging development. "This bill finds the sweet spot," said Rep. Tobias Read, D-Beaverton, in a statement. Audley said the bill will hurt commercial solar development and could halt larger projects. "There's a fair amount of solar prospecting in South-Central Oregon where the sun shines quite a bit -- 2 to 7 MW projects," Audley said. "I'm not sure those ground-mounted solar projects will be built now, if they hadn't already received a BETC." Gov. John Kitzhaber has not signed the bill, but Audley said he expects the governor to do so.